Isn't it funny that no one was able to come up with a worthy Dungeons & Dragons like movie yet? Warcraft is the latest to attempt this feat. I will grant it entertainment; I did not suffer watching this movie. I will not, however, grant it quality approval; Warcraft is your typical collection of underdeveloped characters, special effects laden, minimal story affair designed to make money out of an existing brand. Oh, and there is no ending either, with the powers that be seeking to make more money out of this franchise through the dreaded Sequel. True, Warcraft is no D&D but rather a computer game. A point only the truly invested folk will care about, because for all intents and purposes this is a D&D story of a world invaded by orcs. The orcs are not necessarily baddies but rather refugees from a dying world; regardless, fighting they come, with only fair and compassionate white humans to stand between them and another destroyed world. Of these humans, the one we're meant to keep an eye on the most is that of the character portrayed by Ragnar Lothbrok (sorry, I meant to say Travis Fimmel). Alas, like the rest of them, his is underdeveloped; if anything, the most interesting character is that of a half orc female (Paula Patton). 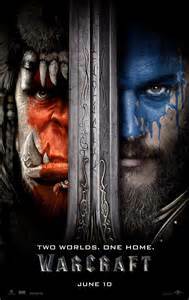 Warcraft is directed by ex Moon's Duncan Jones (yes, Bowie's son). Things often reminded me of a Peter Jackson production, probably due to trying to cram too much into a movie length affair but then still forcing a sequel upon us. Overall: Light entertainment at 2.5 out of 5 crabs.